MANILA – The Philippines observed today the US-Philippine Friendship Day with patriotic groups saying there is no reason to celebrate. The “celebration” only marks the ceremony conducted sixty-six years before in this country when the American colonial government turned over the reins of government to its decades-long trained Filipino administrators.The Americans had first launched a bloody war of conquest followed by years of brutal and deceptive “pacification” that historians said included training local elites for semi-colonial governance. Today, not much has changed with regard to the US-trained Filipino government. From statements of various patriotic and progressive organizations, the current government led by President Benigno “Noynoy” AquinoIII is as Amboy (American boy) to the hilt as you can get, an out and out “US stooge” based on its numerous new agreements with the US government and military. It does not help Aquino’s image that since last Sunday more US troops have arrived for “exercises” in Philippine territory. Since Monday this week, the Aquino government is playing host to a nine-day American naval exercise in the Mindanao Sea, off the coasts of General Santos City and nearby Sarangani province. 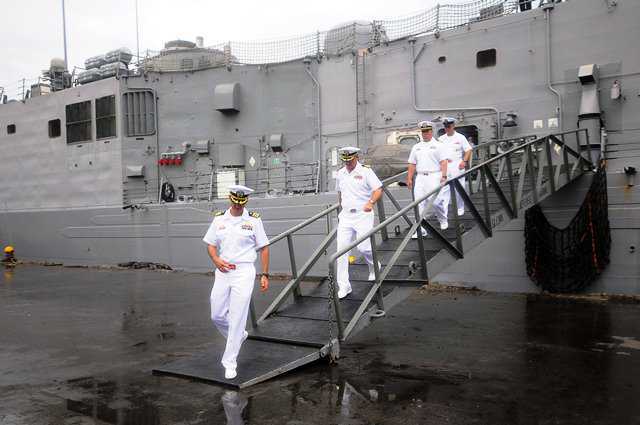 Dubbed as Cooperation Afloat Readiness and Training 2012, codenamed “CARAT 2012,” it is being conducted in areas of responsibility of Naval Forces Eastern Mindanao. After forging an agreement early last month with the chairman of US Joint Chiefs of Staff, Gen. Martin Dempsey, the Aquino government came up with a list of seaports, airports, military camps and other facilities, which it is opening up to US troops. It eventually also granted the US military “unprecedented access” and “unrestricted prerogative” to make use of naval and airport facilities in former military bases in Clark and Subic, even without an appropriate treaty. This week, Aquino infuriated patriotic groups with his request to US for deployment of spy drones over the South China Sea. Something is not right somewhere between the Department of Interior and Local Government and local government units, so much so that it has been noted that neither the LGUs nor the local police force heed the chief of the DILG, Jesse Robredo, and appear to ignore him completely. But aren’t local governments under the control and supervision of the Interior Secretary? If one goes by the what Sulu Gov. Sakur Tan has been saying on the issue of the Jordanian journalist Baker Atyani, it does appear that he refuses to heed Robredo to the point of refusing to launch a search and rescue operations to free the kidnapped journalist and his two Filipino crew from the Abu Sayyaf Group (ASG). ­"[US] bases are all in range of our missiles, and the occupied lands [Israel] are also good targets for us," Amir Ali Haji Zadeh, commander of the elite Revolutionary Guard told the FARS news agency. Millions of Americans will be poorer without the benefits of health reform after Republican states apply a paragraph of the judgment of the Supreme Court in order to escape administrative responsibilities. About 16 states ruled by Republicans threatened not to implement the clause providing for the expansion of the insurance bill proposed by President Barack Obama two years ago. Another seven states have criticized the White House program and also indicated that they do not support the statutes of the new health system. If the boycott case materializes, some 11 million people will be out of federal help. Last week, the Supreme Court ratified much of the regulatory reform of Obama, but clarified that the Oval Office cannot force or fine governments in the case of clause expansion. Two teams of scientists at CERN have confirmed the discovery of a new subatomic particle, which may well be the elusive Higgs boson, also known as “the God particle”. ­"I can confirm that a particle has been discovered that is consistent with the Higgs boson theory," said John Womersley, chief executive of the UK's Science & Technology Facilities Council. This is in connection with its steadfast refusal to use the passenger tubes or air bridge facilities which were precisely installed by the architects when they were building the Ninoy Aquino International Airport Terminal 3 (NAIA 3) for the safety and convenience of the paying passengers allegedly because they trying to avoid shelling out the additional P7,000-service fee being charged by management for every flight. Ever since Cebu Pacific shifted its base of operations from the Manila Domestic Airport to NAIA 3 sometime in 2010, sources claim there has never been one instance when the air bridge was used to accommodate travel-weary passengers in an incoming flight even if it was raining cats and dogs, which saved the company at least P300 million annually. History and experience would tell us that no feudal lord would hand over their land to its tillers on a silver platter. And one classic example of this is the Cojuangco-Aquinos. Since acquiring Hacienda Luisita in 1957 through a government-guaranteed loan, there was no intention on their part to disperse the vast sugar estate to the farmers who have tilled the land for decades, which prompted the government of the late President Ferdinand Marcos to file a case against the family-owned corporation to force the Cojuangco-Aquinos to subdivide the land to its farmers. However, upon assuming power in 1986, the first thing Cory Aquino had to do was to order then Solicitor General Frank Chavez to withdraw the government case against the Luisita management and then circumvent the comprehensive agrarian reform law through the stock distribution option. President Aquino and his Palace aides were into a vigorous chest beating yesterday, warning Chinese officials in their own language to be careful about what they say over the current territorial conflict in the South China Sea after earlier admitting that the Aquino administration is again running to the United States to seek help on the use of modern-day spy planes to monitor disputed areas. Palace spokesman Edwin Lacierda uttered in Mandarin “Xiao xin yi dian (Be careful about what you say)” apparently to make the warning plain to the Chinese. “We hope the relevant party will do more things that are conducive to regional peace and stability,” Chinese Foreign Ministry spokesman Liu Weimin told a daily news conference. The Communist Party of the Philippines (CPP) yesterday blamed the Aquino administration for the killing of Dutch environmentalist Willem Geertman in Pampanga on Tuesday, as it condemned the government for the unabated extrajudicial killings of activists in the country. The CPP, in a statement, blamed that the killing of Geertman and that of Romualdo Palispis in Aurora province, with only a few days interval, to the Aquino administration and its military death squads. “The successive killings of Palispis and Geertman highlight the continuing campaign of terror and extrajudicial killings being carried out by the reactionary armed forces through its death squads under the Aquino regime’s Oplan Bayanihan campaign of suppression,” said the CPP. “The murders of Geertman and Palispis call our attention to the fact that extra-judicial killings by death squads of the AFP continue unabated under the Aquino regime,” said the CPP. Former Vice President Teofisto Guingona’s suffrage rights group is appealing to the Supreme Court (SC) to take a second look at its June 13 decision which upheld the validity of the P1.8-billion deal between the Commission on Elections (Comelec) and Smartmatic-Total Information Management for the purchase of election computers. In a motion for reconsideration, the Automated Elections System Watch (AESW), through its lawyer Felix Carao Jr., said the high tribunal erred when it held that the period of the option to purchase the Precinct Counting Optical System (PCOS) machines has yet to expire since the performance security bond amounting to P360 million had not yet been returned to Smartmatic by the poll body. The SC noted that Smartmatic-TIM submitted to Comelec a performance security or bond in the form of letter of credit worth around P360 million or 5 percent of the automation contract, which would fund penalties should it fail to deliver equipment based on contract schedules or for non-performance. A party-list lawmaker, who belongs to the rightist bloc, yesterday urged fugitive ex-general Jovito Palparan to keep on hiding until he could get a fair treatment from the government. According to Rep. Pastor Alcover of the partylist Alliance for Nationalism and Democracy (ANAD) Palparan should ignore calls for him to surrender. Palparan, who was also a former member of Congress representing Bantay partylist during the 14th Congress, is facing two counts of kidnapping and serious illegal detention in connection with the disappearance of University of the Philippines students Sherilyn Cadapan and Karen Empeño in 2006. The reported plan to transfer the Senate near the University of the Philippines (UP) campus in Diliman, Quezon City is just one of the options and is not yet final, Sen. Franklin Drilon clarified yesterday. A UP regent slammed the move to have the Senate transferred there. Relocating the Senate office to a new “address” was first disclosed by Drilon last Thursday, during a weekly Senate news forum where he mentioned he and two other colleagues tasked by Senate President Juan Ponce Enrile to handle the planned transfer, are examining the possibility of housing the upper chamber to UP Diliman. This came about after Senate leaders realized they have been spending so much yearly as rental payments, between P110 to P120 million since 1992 to the Government Service Insurance System (GSIS) which owns the building where the current upper chamber is operating. Budding videographer and gynecologist Hayden Kho may have lost his license as a physician but he will always remain the undisputed Dr. Love. The Court of Appeals (CA) has upheld the decision of the Professional Regulation Commission (PRC) to revoke Kho’s doctor’s license. In a 17-page decision, the Eighth Division of the appellate court dismissed the petition of Kho seeking to reverse the findings of PRC’s Board of Medicine of immorality, dishonorable and unethical conduct against him. The case arose from the controversial video recording made by Kho of his coital dalliances with a number of nubile women, including starlet Katrina Halili. The CA upheld the power of PRC to suspend or revoke a certificate of registration and professional license of erring professionals. Bayan Muna Rep. Teddy Casiño yesterday criticized the reported entry of presidential sister Kris Aquino and cousin Bam Aquino into politics, saying the move of the relatives of President Aquino betrays their intention to establish a political dynasty which the President himself had been opposing when he was still a legislator. “Nothing has changed. That’s why there is need to bring in voices of new constituencies in the Senate and encourage candidates who may not have the same political pedigree as Bam but who are equally qualified and competent to be senators,” Casiño said.